It was the 13-year-old maid’s desperate cries for help that finally alerted neighbours to her plight. She was standing, sobbing, on the balcony of the upmarket Delhi apartment. Her employers had locked her in, she said, and gone on holiday. Finally rescued by a firefighter, she told a tale that prompted a widespread display of national revulsion. 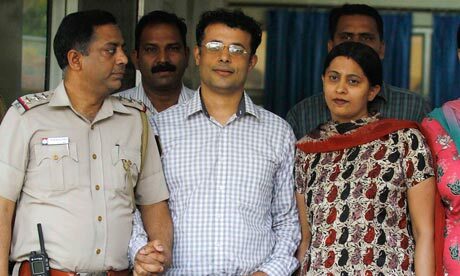 Her employers – middle-class doctors Sanjay and Sumita Verma – had “bought” her from an agency, which had in turn bought her from her uncle. She was hungry, she said, because they barely fed her. She received no pay and was regularly beaten. Their latest act of cruelty had been to lock her in and go on holiday to Thailand. The couple claim that they thought the girl was 18 and deny mistreating her, but they were roundly vilified and have been refused bail. In court the couple were accused of “subjecting the victim to a treatment which can be best described as torture”. Perhaps the most puzzling aspect of the story is why it has caused such fury in a country where, after all, the sight of a youthful servant rarely raises a flicker of curiosity. Delhi’s thriving middle class would crumble without its army of domestic servants, whose presence enables couples to go out to work and continue to boost an economy projected to be the largest in the world by 2050. The most liberal members of that society think nothing of employing a maid, a driver, a sweeper, a cook, a gardener and a couple of house boys who sleep on the roof, or in tiny shared rooms. The International Labour Organisation estimates that there are at least four million domestic servants in India, including about 100,000 children working in and around Delhi. While it has been illegal to employ anyone under the age of 14 since 2006, that has done little to hinder the placement agencies which routinely hire out trafficked children. A good maid might earn 3,500 rupees (£43) a month, if she is very lucky, or about half the legal minimum wage for an unskilled worker in Delhi. The less fortunate are bought from brokers and kept as unpaid skivvies – simply fed and given somewhere to sleep. A company called Domestic Help in India is one of thousands of agencies supplying staff. Based in Gurgaon, near Delhi, the company charges employers 16,000 rupees to arrange the hire of a maid for 11 months. Its website is packed with adverts for staff, who can be selected on the basis of age (15 and upwards), religion and gender. Gurpreet, a maid/cook, has two years’ experience and costs 3,000 rupees a month. Harjett, who has one year’s experience, is available to anyone in Delhi for just 2,000 rupees a month. Those less comfortable with the way the system operates often try to assuage their feelings of guilt by hiring staff at above the going rate. However, writing on an expatriate website that offers advice to foreigners moving to India, Shawn Runacres, managing director of the Gurgaon-based Domesteq staff placement agency, says there should be no need to feel awkward if staff are treated well. “Throw out the guilt – remember you are providing much-needed employment at fair rates and excellent working conditions,” she says. “The very thought of no longer having to make beds, cook, dust, wash dishes and do laundry sounds like heaven and, for those with children, if you add to all these things the possibility of affordable, on-tap childcare, it becomes irresistible.” Speaking on Friday, she said she was convinced that the market for domestic staff would continue to grow as India’s economy expanded, not least because of the challenges posed by living in India. “There are many more challenges to your daily life,” she said. She doubts that it would be possible to live without staff. “You would spend your entire time just trying to keep yourself fed and your home in some semblance of shape. You can’t just get water from the tap; you have to clean your water. You can’t just eat fruit off the tree or out of the market. Is it a luxury? No, not in India. It is absolutely a staple of life.” Runacres’s agency – which does not employ children and promises fair wages and dignity of labour – pays well above the average. Others are less scrupulous. Bhuwan Ribhu, national secretary of the Bachpan Bachao Andolan (Save the Childhood Movement), said child labour was now common in the cities, particularly involving girls aged 12 to 18, while boys aged 10 and upwards are more common in the countryside. “India cannot and must not grow at the cost of millions of childhoods,” he said. Many children are trafficked from poor states such as Bihar and West Bengal through the thousands of illegal agencies operating in the cities. Last year the movement raided a placement agency to rescue six girls and uncovered evidence of 400 girls who had been trafficked. Ribhu says people cannot resist a cheap deal. “Well educated or not, people try to maximise their profits by employing kids. They do not pay proper wages. The probability of children leaving employment whenever they want is very low, and they may be exploited, beaten and made to work long hours,” he said. While many people in India may have been appalled by the Delhi case, he said, there were thousands of others who continued to employ children. “Children work because they are the cheapest form of labour, and in these situations they are victims of slavery. They are abused, not only economically but physically and sexually, as the exploiters also have little fear of law enforcement,” he said. Amid raucous music and the wild cries of his rambunctious patrons, Mongfa withdraws into his shell to contemplate what might have been. Stateless children living along the border come from a variety of ethnic backgrounds. Many don’t have the motivation to pursue higher education as they cannot find formal work after graduation without the all-essential citizenship card, which they do not have. Some exhibit extraordinary talent but cannot hone their skills because they lack citizenship recognition. More serious attention from the media is being urged to bring the problem of statelessness into the wider public spotlight. Mongfa looks at the university students drinking at the bar and ponders his situation. The young bartender vainly tries to find an answer to why it is they have what they have and he doesn’t – the right to study. If he had that right, he would quit the pub he works at immediately. A-Mong in fact refers to a real stateless boy, Mong Thongdee, born to Myanmar construction workers who was the subject of intense media coverage when chosen to represent Thailand at a paper plane competition in Japan in 2009. His dilemma was that he was not eligible for a Thai passport (after considerable publicity, he was given special dispensation to leave the country). 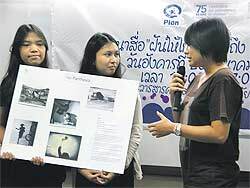 The short film competition, inspired by the plight of people like Mong, was co-organised by Thammasat University and UK-based children’s rights group Plan International. It attempts to unravel the complex, yet poorly reported, issue of the plight of stateless youngsters born to ethnic-minority parents or migrant workers who are struggling to gain Thai nationality. The five films will hopefully spur more interest in the issue, not only among the general public but also the mainstream media which often side-steps significant issues simply because they are difficult to comprehend. “The media has shown little interest in this issue,” Thai PBS TV reporter Wilasini Supharot told a seminar on stateless children at Thammasat University’s faculty of journalism and mass communication. The seminar preceded the announcement of the five finalists in the short film competition. The contest was open to all students across the Thammasat University campus. The winning film will be announced in October. 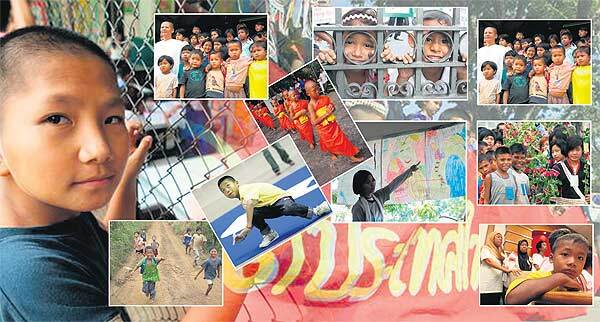 According to Plan International, there are one million stateless people in Thailand. More than half of them live in Chiang Rai’s Mae Fah Luang district. Statelessness is a complicated issue. It involves interpreting the law and digging deep into the facts to find the truth about each case. Some media outlets are reluctant to cover such a complex story because they are unsure whether their audiences will like reading, watching or hearing about it. “Before selling [the news], they have to consider if a story will be popular or not,” says Voralux Issarungkula na Ayudhya, a senior reporter with Thai PBS. Media outlets place more emphasis on covering “social” beats, focusing mostly on urban issues which they think are more relevant to an audience than those concerning stateless children living in far-flung border areas, Ms Wilasini said. The issues that spring up from the lack of access to education and citizenship should not be neglected, she says. 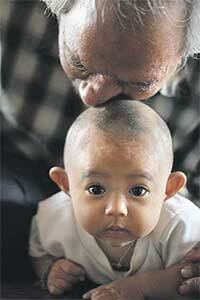 Otherwise, stateless youngsters could end up on the wrong side of the law, causing even bigger problems for everyone. 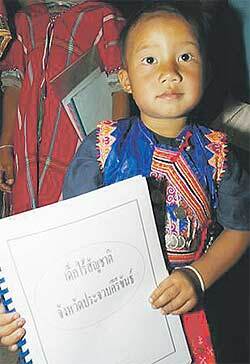 A 2005 cabinet resolution granted the right to education to all Thai children as well as stateless kids. “However, journalists must watch with their own eyes to see if or how stateless children can enter the education system,” she says. Tuenjai Deetes, a former senator and an advocate for minority rights, says some children are discouraged from going to school because of the distance they have to travel from their villages and the fact that their parents cannot afford the cost of transportation. Transportation, however, is only one of the problems. Children are not motivated to attend classes because they do not have citizenship cards. Without these cards, there is no way to find good jobs after graduation. Kopkit Chemuen, an Akha hilltribe teenager in Chiang Rai’s Mae Fa Luang district, shares this fate. He says his friends sigh when they learn that stateless students who graduate cannot be employed in the normal workforce because they do not have citizenship cards. 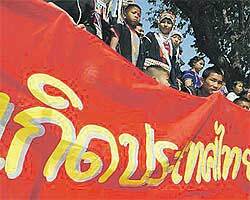 “They decide to drop out of school,” says the Mathayom 3 (Grade 9) student. He was among four hilltribe kids from the same district invited to share their views with the young, prospective film producers who are only just now grasping the depth of the stateless children’s dilemma. Despite the seemingly futile talk during the seminar about the strenuous fight for Thai ID cards and their uncertain future in tertiary studies and work, the four youngsters do hold out hope. They look on the bright side of life, although their words are really a cry for help. At the end of the talks, 17-year-old Amae Becheku, an Akha highlander, asked the film contestants to bring their plight into the open. The organisers hope the films will attract the attention of society and bring people closer to the problems of stateless people. In Ms Voralux’s view, the films will do more than entertain. They will put this issue into the spotlight and increase awareness about marginalised people. She says the films should convey and highlight parts of stateless people’s lives that touch the hearts of viewers. Ruj Komonbut, a Thammasat University print media scholar, says he also hopes the short films will lessen the “us and them” mentality. Running deep in the psyche of many people is the stereotype of highlanders whom they mock as khon bon doi(people of the mountains) who speak Thai with a funny accent. 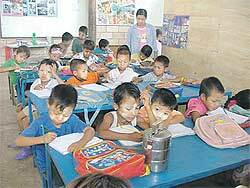 The hilltribes people are alienated and regarded as non-Thai. For the students who made the films, he hopes that one day they will become experts on the issue of stateless children. Mongfa is a protagonist in a movie by two advertising major students of Thammasat University who have joined a short film contest featuring stateless children. The film tells the story of a stateless boy from a poor family in a remote village of Thailand. Mongfa dreams of becoming a pilot, but he ends up working as a bartender at a pub, the only workplace willing to recruit him without asking for his citizenship card. He cannot find a better job as businesses he approached demanded he produce a Thai identity card, which he does not have. The boy, who only possesses a Mathayom 3 (Grade 9) level education, cannot continue his studies because he needs to earn money for his family now that his father has passed away. Also, he cannot go any higher in his education as the nearest high school is a very long way from his village and getting there would only incur more expense for his family. His meeting with university students at the pub where he works one night is an attempt by the young film producers to paint a contrasting picture between Mongfa who faces limited opportunities to pursue higher education and those students who enjoy the right to education blessed by a card confirming their Thai nationality. “It’s a comparative technique,” said Nonthakit Chawengchutirat, hoping the contrast would be a pointer to the importance of giving educational opportunities to needy children. Mr Nonthakit’s team is competing with four other finalists mostly from his faculty of journalism and mass communication. One team which made the cut came from the faculty of political science. The team of non-media major students also came up with a similar plot telling the story of a stateless teenage girl whose mother has fallen ill. The teen is struggling to find money to feed her family. Like Mongfa, the girl cannot pursue her studies because of poverty. Her family plight is aggravated by the fact that she is stateless, which prevents her from getting a decent job even if she has the means to finish higher education. She is eventually lured into working as a child labourer at a cloth dyeing factory, though she is only 13 years old. In real life, the fate of stateless children may be similar in some ways to that of the poor girl who is invisible in society without a citizenship card. But through the film, “we want her to have an identity and rights” like other children, said Vanida Khunrod, one of the producers of the film who majors in politics and government. 0.051 seconds. Packaged by Edublogs - education blogs.